Welcome to the Crafting Writs Guide. 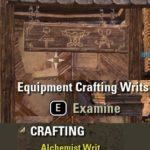 Today I will explain what Crafting Writs are, how you can do them in the most efficient way and what you will get when you complete Crafting Writs. Crafting Writs are daily quests for your character. You can take a Crafting Writ quest for each of your crafting skill-lines. 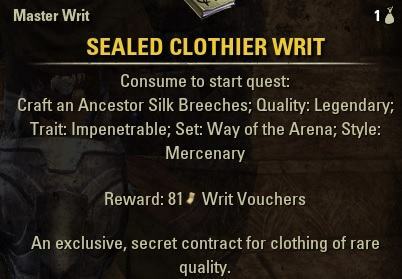 When you complete Crafting Writs you will get materials (even gold materials!! ), Inspiration experience (experience you need to level up crafting) and Master Writs (rare chance). I highly recommend doing them because they can drop very rare gold materials once you reach a high level in your professions! Yes you need materials to craft them, but the profit you can make is ten times better. Your character needs to get certified before he can start doing Crafting Writs. This is not a difficult task, it is quite easy to get certified. All you have to do is walk to the closest Writ Board, you can find those in every town or city. Once you have taken the quest you need to visit the certification trainer NPC in either Davon’s Watch, Vulkhel Guard, or Daggerfall, depending on your alliance. When you talk to the certification trainer you will be given a quest that you need to complete. There are two different certification trainers, one for equipment crafting professions (Blacksmithing, Woodworking, Clothing and one or consumables (Alchemy, Provisioning, Enchanting). You can only have one quest at a time active, the quest to complete each of those certifications is quite simple, just follow your quest journal. Keep in mind that your character must be level 6 to activate those quests. Note: You can go to the Trainers yourself and start the quest for certification, you do not need to wait for the quest to become available on the writ board. In case you are already level 10 or higher in some crafting professions, you can simply skip the quest when you talk to the trainer to get instantly certified. Crafting Writ quests are easy to spot once you know where they are and how they look. Every day you can walk into a town or city and look out for those “Writ Boards” that will give you the quest. You can only pick the quests if you are certified for the professions, otherwise the board will not show anything. The quests are always more or less the same, craft something and hand it in to the NPC with the marker, you can also track the quests in the quest journal in case you get lost. Inspiration is needed to level up your professions (experience). When you do Crafting Writs you will also gain a lot of Inspiration and that way you can even level up your professions faster. Once you reach maximum level this will no more be of any use, but don’t worry, there is more! Every time you finish a Crafting Writ quest you will also get a package, which contains raw materials, trait stones, reagents and other improvement materials. 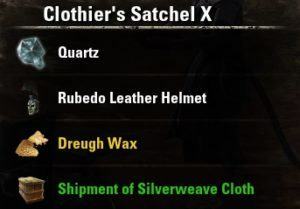 This is the most important thing, because those things can also contain gold materials that you need to upgrade your gear! 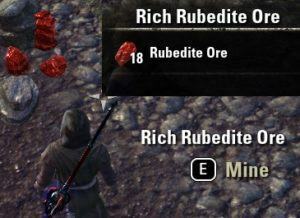 Imagine you have 6 Characters and you do 6 Crafting Writs every day, you will get plenty of gold materials in no time! You will also get Survey Reports that you can use to find nodes that contain more materials than normal nodes. They are similar to treasure maps but basically ten times better, you will find a highlighted area on the map, once you reach the highlighted area you can find a lot of resource nodes that you can harvest. Blacksmithing, Clothing and Woodworking drop a minimum of 108 raw Materials each. By completing Crafting Writs you also have a small chance to drop Master Writs. Master Writs will give you a quest to craft a certain item in a certain style. Once completed you can gain Writ Points that you can use to get something very rare. For the Blacksmithing, Clothing, Woodworking Crafting Writs you simply have to craft some items at the crafting stations, the quest log will tell you what to craft, once you have all the items you can hand in the quest. 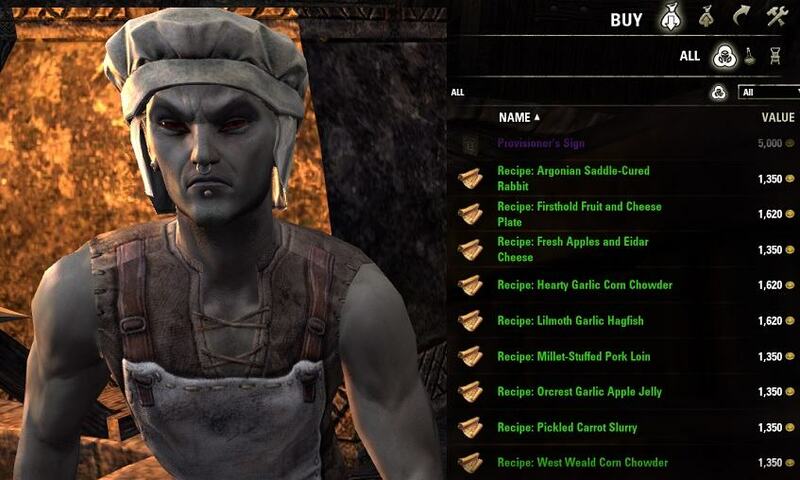 The easiest way to do Alchemy Crafting Writs is to pre-craft all the possible combinations. When you pick up the Alchemy Crafting Writ quest it will automatically detect the Potions in your inventory so you can directly go to the quest location and finish the quest. 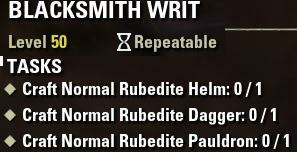 The easiest way to do Provisioning Crafting Writs is to pre-craft all the possible 6 combinations. 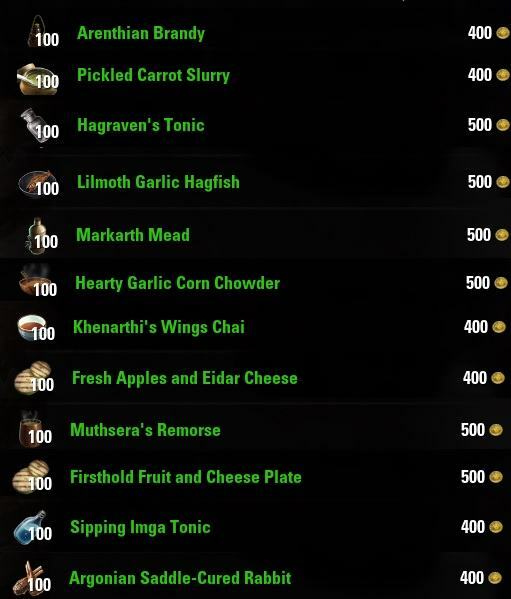 When you pick up the Provisioning Crafting Writ quest it will automatically detect the food in your inventory so you can directly go to the quest location and finish the quest. 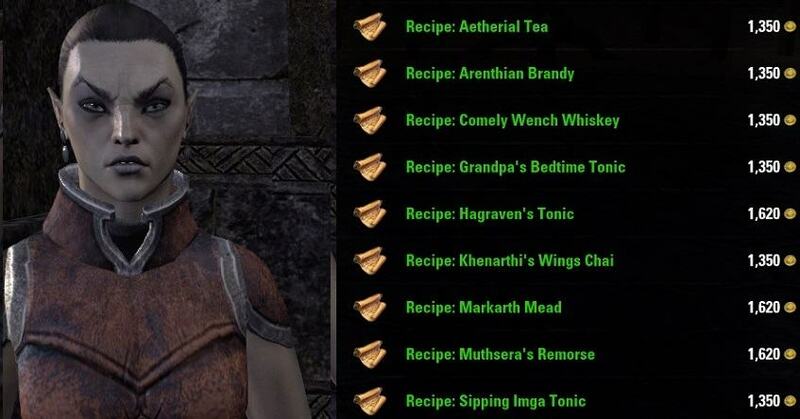 You can buy those Recipes either in a Guildstore or from a Chef & Brewer in most Taverns. Then you can simply craft all of them and spread them across characters or put them into the bank and withdraw when you need them. Huge shoutout to Dolgubon for creating this awesome addon. This is the most important addon for Crafting Writs. It is such a time saver, it basically crafts all the things automatically that you require to complete the quest.